We learned installation process of CodeIgniter in the last session. 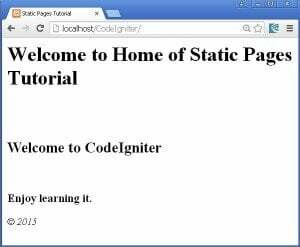 So from today onwards we will learn how to use CodeIgniter. 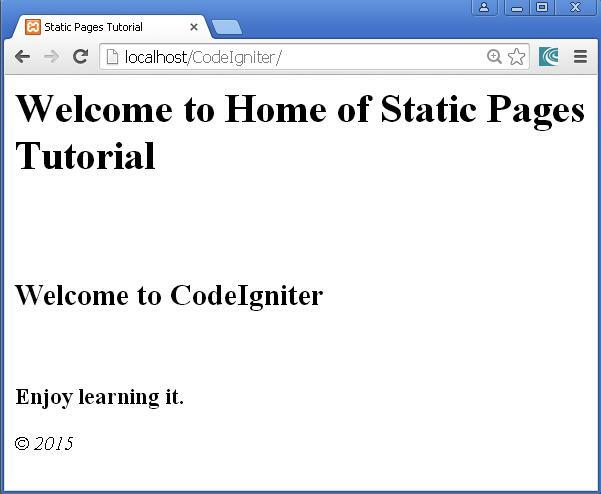 For today let us learn to create static pages using codeigniter in this Creating Static Pages in CodeIgniter tutorial. 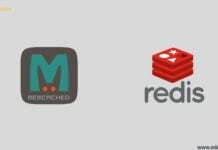 We know that codeigniter works to MVC (Model-View-Controller) software architecture. This model is about separating the logic from its design (presentation) part. This model consists of 3 parts: view, controller and model. The user interacts with the view by performing operations like clicking a button or submitting a form, etc. The controller handles the user input and transfers the information to the model. The model receives the information and update’s its state. 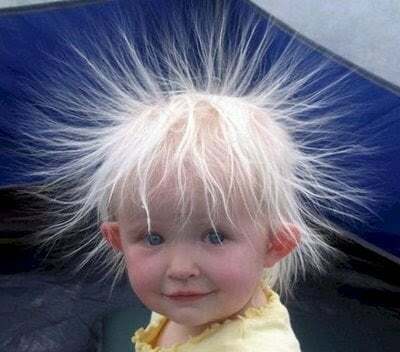 The view then checks the updated state of the model and responds accordingly. The first thing in creation of static page is setting up a controller. A controller is a class that helps delegate work. 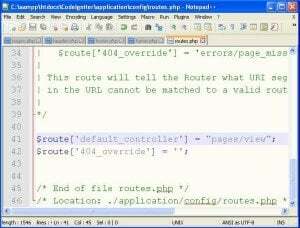 For this you have to create a file pages.php in CodeIgniter/application/controllers i.e. 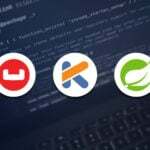 the path of pages.php will be CodeIgniter/application/controllers/pages.php. Here we have defined a class named Pages that extends CI_Controller. CI_Controller is an inbuilt application controller class located in CodeIgniter/system/core/Controller.php file. 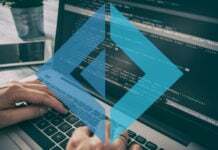 Since the Pages class extends CI_Controller class, it can inherit the methods and variables defined in CI_Controller class. Next the class Pages has a function view() defined in it with one parameter that takes a page as its parameter. 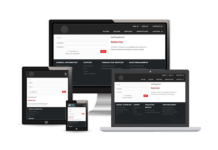 The controller will now become the centre of your web application. 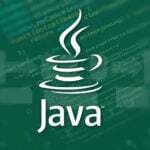 It will be considered as a super object and will be denotes as $this just like a class in PHP. Next step is to create two views (common pages to all other pages) i.e. two page templates. Template is a logic that written once can be used number of times. We will create two PHP pages, one for header and another for footer that can be used as templates in the web application. 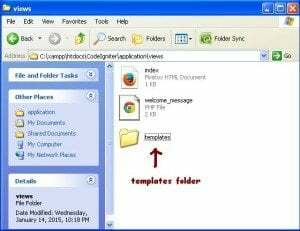 For this you need to create a folder templates in the CodeIgniter/application/views, so that your common files remain at one place in templates folder. Here our header and footer are ready to use with any other page. We have the html head section with title in the header.php page. We have also started the body section in header.php page with a statement that welcomes the user in the particular page opened. Next we have a footer defined in the footer.php page and closed the body and html tag. The common things have been done, now we need to create the body part of the page. 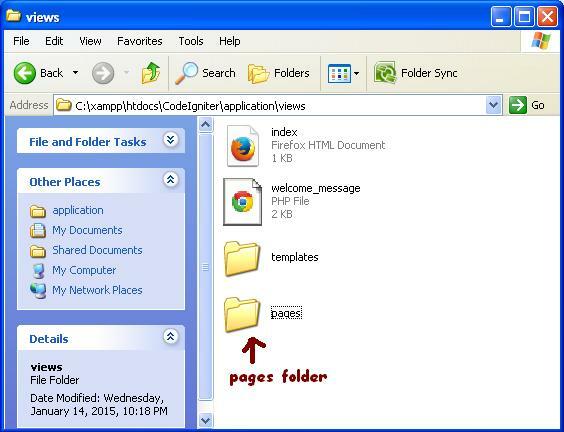 For this create another folder named pages in CodeIgniter/application/views folder. 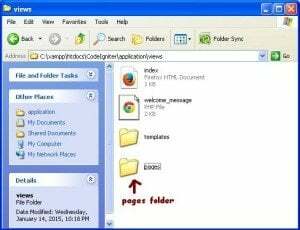 Inside this pages folder create a file home.php which will contain only the body part of the homepage. Here we have just coded the body part of home.php page. The body tag of html has been started in header.php page, so directly the content is written in home.php page. 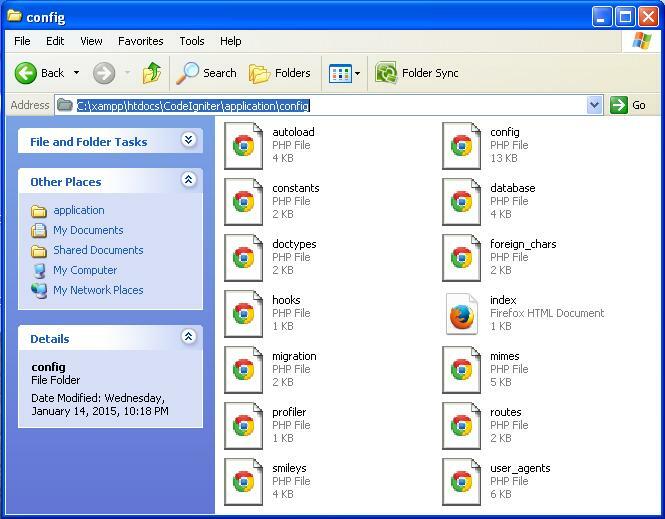 You can create any number of pages in this pages folder that you want in the web application. 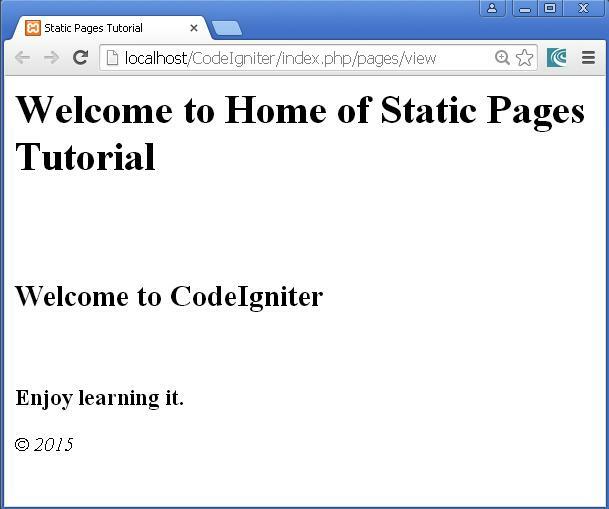 Editing the pages.php file in CodeIgniter/application/controllers. We have now finished with the templates and the body of homepage. So to assemble all these pages we have to approach the controller which is pages.php file in our case. We had set up a controller with a view() method. But now we want to display the page we have created. 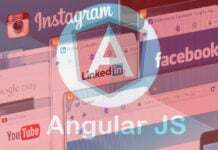 The pages should be displayed in the header, home, footer order so that the header section come at the top, the home page body in the middle and the footer at the bottom. 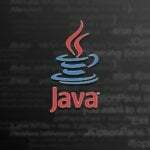 Here if the desired page exists, it will be displayed otherwise error message will be displayed. Here we have passed the page in our $page parameter to the in-built ucfirst() function which capitalizes the first letter of the string and stored in the $data array with key title. Now the $data array contains the title of the page with its initial letter capitalized as the value of key title. Here, we have the path of header.php page and the $data array as parameters of the view() function. So in the second parameter of view() function $data array is passed to the header page to make the title available. Remember the values stored in $data array are assigned to the variables with the names of their keys. I mean the $data[‘title’] in controller will be accessed as $title in view. Then after the header, the home and footer is also loaded similarly. Next step is to see your page in the browser. Before browsing your page let us understand something about the URL supported by MVC architecture. 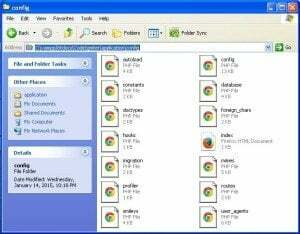 So we will browse our page in the similar manner. 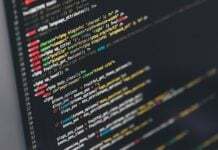 http://localhost -> is your localhost machine. 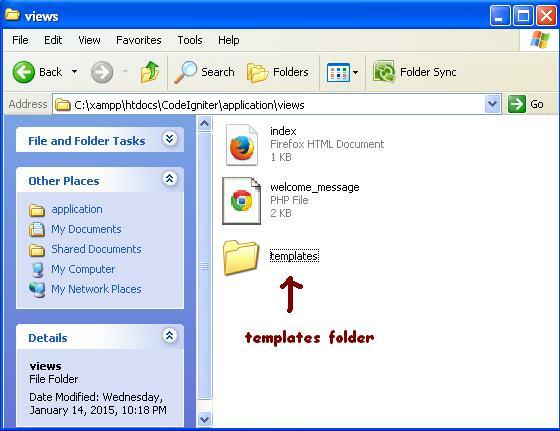 Go to CodeIgniter/application/config folder and open routes.php file with notepad/notepad++. 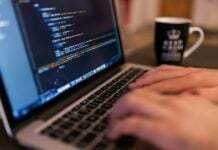 This will set our web application controller as default controller as we have assigned the $route’s default_controller parameter to our pages controller-class followed by the view controller-method. 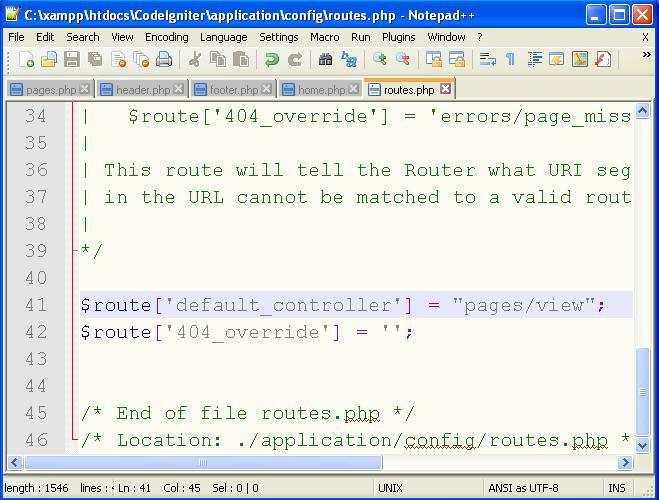 Save the routes.php file after the changes and close it. You will get the same output as shown in fig 3. Still the output with the above address is shown below which allows auto-loading of our web application. 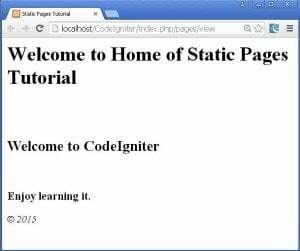 Thus we successfully learned to create static pages in codeigniter in this Creating Static Pages in CodeIgniter tutorial. Super article. when I run it is showing 404 error. Great Article. This post would be preferable for the beginners. Thank You for sharing.